Beautiful Bella has come so far since she arrived with us as an emergency back in December, we were told by the owner if we didn’t take her then the son would shoot her. She had bit her elderly owner on his hand, although we realised there had to be a good reason why she did this. She arrived in a crate and she hated everything, especially us humans. The only person who she let near her was Matthew (looks after her at the kennels) who quickly won her over, but then he did get her out of the crate and she was a shivering wreck. Someone had broken this girl and we knew she would need time, patience and understanding to get over this trauma. She cringed when you touched her, she so had lost her trust in people. Several months on and she has put on weight, she goes out walking with us and does not react to cars, dogs or people.. she has learned to trust again. She will now allow us to brush her, she is still slightly anxious and will often nibble at the tip of her tail, this can sometimes be sore just have to be careful applying anything as she can and does get a little upset. She is a very active girl she loves her boomer ball, in fact, whoever adopts Bella will also need to adopt her boomer ball too. Although she does not react to dogs, we have not let her off the lead with one yet. Whoever adopts her, if they have a male dog we would prefer for them to meet her a few times and build a relationship before both dogs interact. 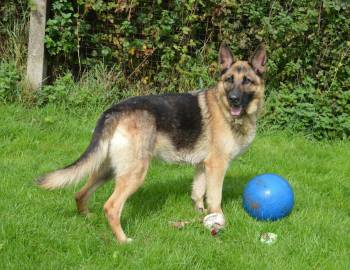 This is one very special girl, so it doesn’t matter how long it takes to get her a home, it must be the right one.